The summer of 1276 at Tyndal Priory is peaceful—or was until Kenelm's corpse is found floating in the millpond. When Brother Thomas concludes the murder occurred on priory grounds, Prioress Eleanor and Crowner Ralf swiftly agree to help each other solve the crime. The murder victim was disliked in Tyndal village, and no one wants one of their own hanged for the deed. Fingers quickly point to a Jewish family, refugees under the relocation provisions of King Edward's Statute of the Jewry. Riots loom, threats against the family mount. Eleanor and Ralf have little time before popular opinion rules the murder solved. But did Jacob ben Asser really kill the man? Or was it Brother Gwydo, a new lay brother with an unknown past? These questions are difficult enough, but when Gytha, the prioress' maid, joins the suspect list, the inquiry takes an even more troubling turn. Murder investigations are always grim, but this one grows as ominous as a North Sea storm. Once again, Prioress Eleanor jousts with the Prince of Darkness for the sake of justice, but this time even she wonders if unmasking the killer is something she wants to do. "Period details fit unobtrusively with the action, and the pacing makes this a one- or two-sitting read at most." 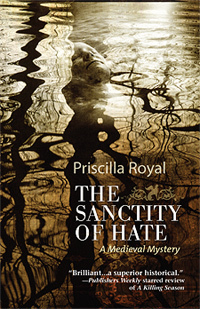 "Enthralling medieval mysteries...vividly drawn characters..."
"Historical mystery fans will find much to like here. The novel is well researched, with an intriguing plot and a timely message about religious tolerance."